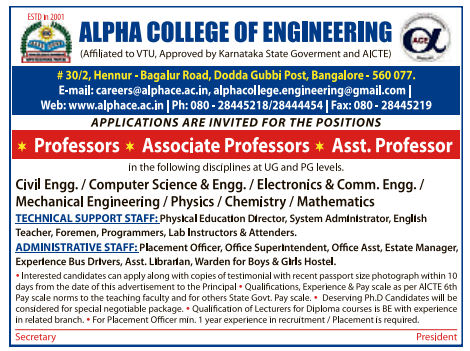 Alpha College of Engineering, Bangalore has advertised in the DECCAN HERALD newspaper for recruitment of Professor / Associate Professor / Assistant Professor Plus Non-Faculty jobs vacancies. Interested and eligible job aspirants are requested to apply within 10 days from 09th May 2018. Check out further more details below. About College: Alpha College of Engineering is located in the salubrious outskirts of Bangalore. The city has metamorphosised from being merely the silicon valley of India and melting pot of our diverse cultures to one of the information capitals of the world. It is a forerunner in knowledge expertise in the today's fast paced information age. The college is fourteen kilometers from Bangalore city railway station and 200 meters away from outer peripheral ring road and Express Highway connecting to Devanahalli International Airport. How to Apply: Interested and eligible candidates are requested to send CV along with copies of certificates / testimonials and recent PP size photo to the college address provided here.